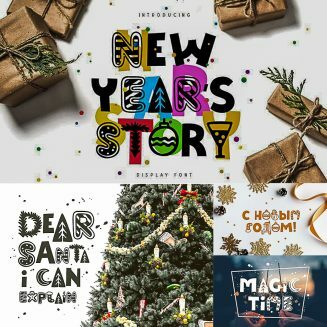 New Year’s Story is a funny Christmas font. It comes with usual uppercase characters and New year’s lowercase symbols, large set of punctuation glyphs, numerals, cyrillic characters and multilingual support. Ideal for design of any Christmas stuff: cards, posters, t-shirts, product packaging, etc. Tags: 2019, Christmas, Christmas font, cyrillic font, decorative font, festive font, holly, lettering, New Year, packaging, Xmas.